This means using your investigative skills and third party websites to reverse the link. So, if you have not taken the time to challenge yourself in reversing the link—please do so now. This article will spoil the fun by explaining what the link is, how we created it, how we would safely deconstruct it, how different browsers react, and how this was leveraged for fun to educate students about the danger of URL redirects. For this step, we use one of the URL shorteners called tinyurlchecker. The following site did reverse our URL. As you can see, the URL above has a fair amount of encoding at the end which prevents us from easily viewing the intention of the URL. 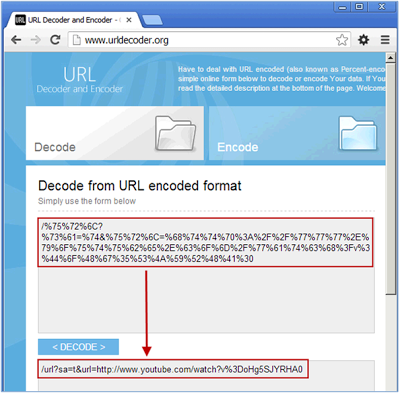 We can use a URL Decoder to decode the URL (discussed last week). So now we know that the redirect is to youtube. But what is the target within youtube? When googling the last portion oHg5SJYRHA0, the first link is to Rick Roll'D. 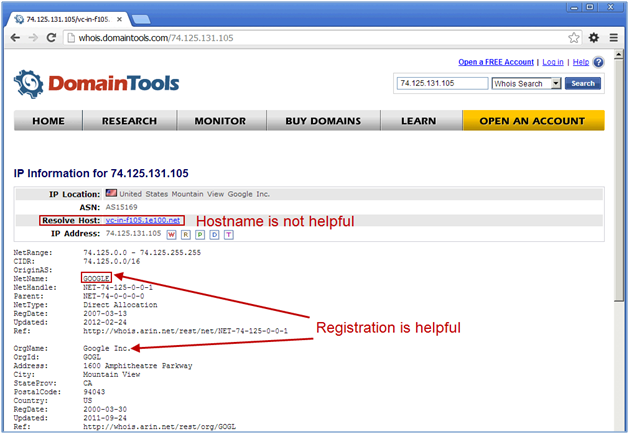 But we still do not know who is redirecting the victim-we need to figure out who owns the IP address. 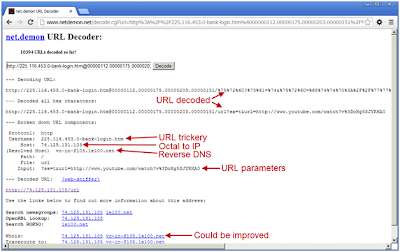 Both reverse DNS lookup or WHOIS queries could reveal a little about the owner of the site. However, when trying to perform a reverse DNS lookup, it was less than helpful returning: vc-in-f105.1e100.net. Thus, for this we will try a WHOIS service. We will briefly discuss WHOIS in the next article; however, one of our favorites is DomainTools' WHOIS service. 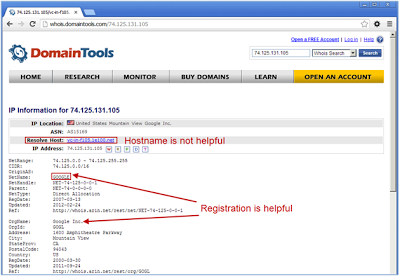 WHOIS records show that the site is registered to Google-which hosts the redirect. Using manual analysis, we have all of the pieces of information needed to put together the events of this attack. The most succinct description is a Google URL redirect to a Rick Roll YouTube video that has been URL encoded, represented as Octal, with fake authentication wrapped in a TinyURL. In this example, LongURL took top honors because it provided at least one of the intermediate URLs and was able to go from shortened URL to the rick roll site (even providing the title of the page). While unshorten.it did not provide any of the intermediate URLs, it did gracefully resolve the target completely and provided the title of the site. While Netdemon could not get past the URLshortener, once the longer URL was entered, it performed best at breaking down the URL components. 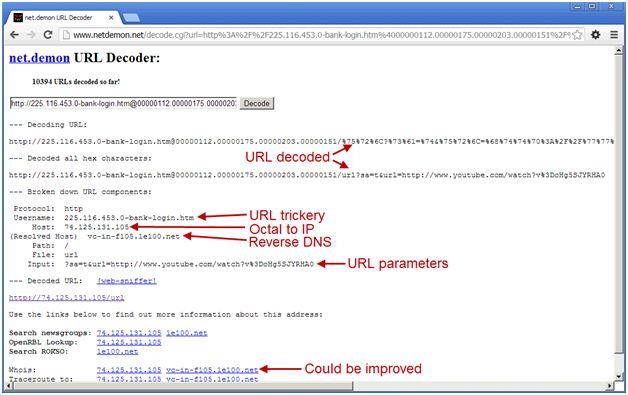 As a result, netdemon was able to URL decode, remove the URL trickery, convert octal to dotted decimal, and pick out the URL parameters that was passed to Google. Its WHOIS could perform better though and provide more information without hitting a third party site. Still, overall it was very useful. The point is that by using just a couple of automated sites, you can easily obtain every piece of critical data in a much shorter period of time than if you did this manually. 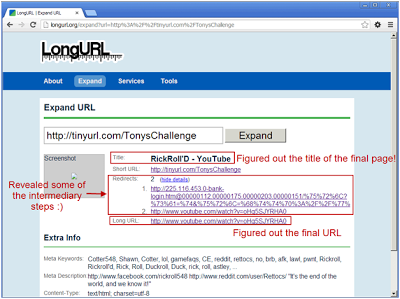 The only technique above that we did not mention in the previous article was URL redirects because we did not want to spoil the challenge. In very simplistic terms, a URL redirect is an application that accepts a parameter that allows the end user to be redirected to another page. This is a lot of fun for the attacker because it happens so quickly that the user does not have time to react and stop the next page from loading (thus when you see Rick dancing—evil has prevailed—mission accomplished!). URL redirects also allow the attacker to leverage the good name and reputation of the vulnerable site which helps the credibility of the link (as you will see in our example later). As a result, combine the fast nature of the redirect and the credibility leveraged and you get the perfect storm for a phish. The user will in fact go to vulnerablesite.com first; however they will then be whisked away to attacker.com where the bad guy will most likely serve up malware, clone a page, or perform some other evil deeds. The first challenge that the attacker faces is finding (or maybe hosting) a page that has a redirect to confuse the user. From an attacker’s point of view, it is best to leverage someone else’s page in order to leverage their credibility, but also to distance them from the attack. That link will first take you to Google and then to YouTube for the Rick Roll (see the Fiddler proxy screenshot below to see how the attack works). Step 1 - Initial request to the vulnerable web server with the parameter that will cause the redirect. There wasn't a particular reason to choose Octal other then to add an additional layer of difficulty to the challenge. The technique was covered in detail in our last post so we'll keep it short and sweet here. nslookup www.google.com resolved one of Google's web servers to 74.125.131.105. Using Microsoft's Calculator, we converted the IP address - 74 = 0112 125 = 0175 131 = 0203 105 = 0151. Thus, an attacker may not want to use this obfuscation unless they know they are targeting a Chrome audience. However, for your enjoyment, let's do it!! Try it out in Chrome if you have it installed. Smooth as butter. IE will not work and Firefox prompts the user to confirm :( Ok, on to the last step! One last step for the obfuscation challenge is to take that monstrosity of a URL and shorten it with your favorite shortener. 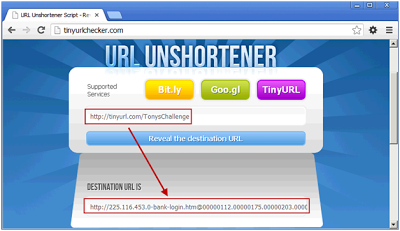 We used TinyUrl because it allows us to specify a memorable link such as TonysChallenge. 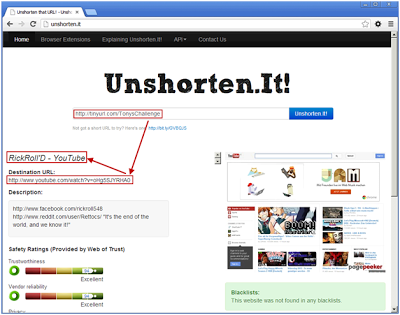 Step 1 - The user's browser initially hits TinyURL to unshorten the URL to the URL trickery address. Step 3 - The octal address resolves to Google and then Google responds with a Location header to redirect the user to Youtube goodness. Step 4 - User follows the location header to Youtube for that final moment of realization where it is too late to take back their actions. As mentioned earlier, using IE on this link would not even work due to the URL authentication being removed from IE 7 and later. Using Firefox would prompt the user and potentially ruin a good opportunity for an attacker. Chrome on the other hand would have worked beautifully. But think about this: Why would we want to use TinyURL when the site we were using as a redirector is Google? Answer: We probably don't. If we keep the URL the way it is we leverage the reputation and credibility that Google has that they won't exploit users. Thus, see the following real world example that worked beautifully. Im in your web hacking class which started yesterday. Just letting you know ill be in late today - between 10 and 11. This email may contain confidential and privileged information for the sole use of the intended recipient. Any review or distribution by others is strictly prohibited. If you are not the intended recipient, please contact the sender and delete all copies. Thank you. What do you think someone does when they receive this link? Well, they want their email to be routed properly and it is coming from google.com. There are no URL authentication tricks there, just a long URL. So they click it of course! Pure evil >:) But insanely funny. It helps students remember to be careful with URLs in emails. jajaja very tricky email. Muy bien!